The Pelicans will apparently announce the winner in September, which is also when Shreveport will decide whether or not to go forward with one of the saddest and dumbest arena financing deals in recent memory. As the Shreveport Times reported, Mayor Ollie Tyler announced plans to move forward with a $100 million complex in downtown Shreveport. More details will be revealed at a city council meeting tonight, but the complex is a mixed-use deal, which will include a 3,000-seat arena as well as condos, shops, and a sports complex. Tyler’s plan calls for the city to kick in $30 million of public money. The plan actually calls for the city to sell $30 million in revenue bonds, with the revenue to come from … hang on, I’m sure it’s in the proposal somewhere … scroll, scroll … okay, it doesn’t actually indicate that at all. Maybe the team will pay lots of rent! Or maybe, considering that the Pelicans are owned by the guy who has a 13-foot statue of himself outside the stadium that he successfully got the state of Louisiana to both pay to renovate and to pay his team an annual fee to play in, it’ll just be tax revenue that the city would get anyway. From what I can tell from this very uninformative TV report, the Shreveport city council voted 5-2 last night to approve … something, though whether it actually commits the city to go through with it if the Pelicans select it as a D-League site isn’t entirely clear. Meanwhile, Pensacola is pitching its own $80-100 million arena and mixed-use complex, with a “not specified” amount of public money. This is the problem with minor-league sports venue deals: With no shortage of small cities thinking this is just what they need to put them on the map, but a minuscule economic impact even by the usual not-very-impressive sports standards, it’s a perfect recipe for a costly bidding war. C’mon, Shreveport and Pensacola councilmembers, be like Nashville and read Deadspin before discussing your local sports venue deal! Meanwhile, here’s an image of the Shreveport arena rendering. Do we think that there’s some kind of sports-pedestrian clip art that renderers use for these? If not, why is that woman in the sunglasses chewing her fingernails? *Yeah, I know the D-League has a new name thanks to a corporate naming-rights deal, but neither Deadspin nor I play that game. Smoothie King CEO Wan Kim, who purchased the company from founder Steve Kuhnau in July 2012, said the NBA wanted to make sure its athletes could eat and drink Smoothie King products and still pass the association’s mandatory drug tests. That sort of makes sense, I guess, but what the hell kind of smoothie contains banned substances? None, it turns out, but Smoothie King does sell certain “nutritional substances” that turn out to contain two steroids: dehydroepiandrosterone and androstenedione. The company says it will now stop selling them. NOLA.com presents all this as a sort of amusing sidelight to the Pelicans‘ already-plenty-amusing naming-rights deal, but really the big news should be you can fail a drug test by consuming stuff you buy at the local smoothie outlet. This is something we all might want to consider before decrying as evil any athlete who now uses or has ever used (or is rumored to have used) banned substances. Except for A-Rod, anyway, because you just have to hate that guy, right? The New Orleans Pelicans and Louisiana-based Smoothie King have reached a 10-year agreement to rename the New Orleans Arena as the Smoothie King Center. On the bright side, at least it’s clear what a Smoothie King sells, unlike a Globe Life. Still, it’s getting increasingly hard to see why anyone should be using these branded names for buildings, since they change about as often as soccer jersey logos. 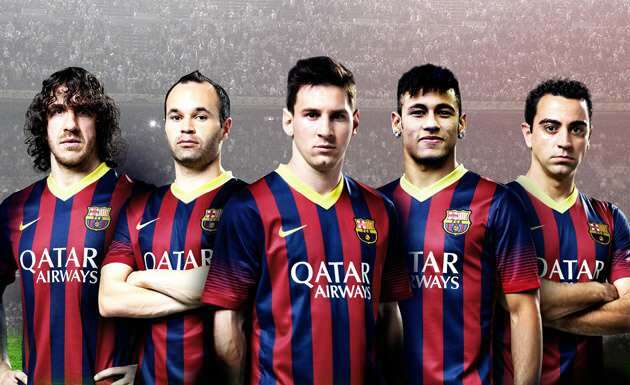 (Thankfully, no one has tried to insist that we call them “Qatar Airways FC Barcelona.” Yet.) It’s easy enough to call the Rangers’ ballpark “the Rangers’ ballpark” (in fact, it’s officially been “The Rangers Ballpark in Arlington” the last few years, not that I’ve noticed), call the New Orleans arena “the New Orleans Arena,” and so on. At least until the teams give us a cut of the product-placement moolah. Hey, New York City’s transit agency does it! Now there are 16 new loge boxes in the lower bowl, which are already sold out for the upcoming season, that includes swivel seating and LED monitors. There’s a party perch in the upper bowl where fans can order drinks and mingle at a bar and the Pelicans are considering adding live entertainment that could include a band playing during games. Pelicans owner Tom Benson no doubt hopes to make a bundle on selling high-priced tickets via the lure of these glitzy amenities, but even if he doesn’t, no worries: It’s all being paid for by the state of Louisiana, as agreed to as part of a ten-year lease extension when Benson bought the team last year. Plus he gets $3.65 million a year in tax breaks, in case he can’t boost his profits by his own self. Which is just as you’d expect Benson to negotiate, given that as owner of the Saints he pretty much invented pay-to-play leases. The Louisiana state house has slightly reduced the tax breaks being considered for the New Orleans Hornets (now in the process of being sold to Saints owner Tom Benson) from 15 years of $3.65 million tax rebates to 10 years. Though if you read the articles at the time it was first announced, it’s only a ten-year lease extension, so giving 15 years of tax breaks never made sense in the first place. Anyhoo, the Hornets’ new round of taxpayer subsidies will now amount to only the ten years of tax breaks (worth about $28 million in present value, by my Excel calculations), plus $50 million for renovations to the New Orleans arena. In exchange, the Hornets promise to remain in town through at least 2024, which means that there should be no talk of new arenas and move threats for at least the next year or two. The state will also be required to file annual reports on the number of jobs created or retained by the tax rebate, which should at least make for some entertaining reading. The state will supply $50 million for renovations of the 13-year-old New Orleans Arena, funded mostly by capital bonds (repaid out of general state revenue, I believe), which should supply the Hornets with additional revenue from new ad boards and the like. The Hornets will keep on getting $3.6 million a year in tax breaks that they received under the old deal. The state will no longer have to kick in subsidies if Hornets ticket sales fall short of the team’s desires, as was the case under the old lease. That could be as much as $6.8 million a year in savings over ten years, or it could be nothing, if the Hornets draw well enough that the subsidies wouldn’t have kicked in. The Hornets no longer get an out clause to break the lease if attendance doesn’t reach certain benchmarks. All in all, it looks like a relatively small price to pay to lock up the team for another ten years, though this is more in the “no worse than the old crappy lease” category than actually qualifying as a good lease. The deal is still tentative pending the Hornets’ sale to local owners and approval of the tax breaks by the state legislature, but both of those are expected to occur soon. All of which likely means: No Hornets for you, Seattle. Chris Hansen, the hedge-fund rich guy (I keep wanting to write “millionaire” or “billionaire,” but his net worth doesn’t appear to be public record) who says he’ll build an arena in Seattle with mostly private money, says he’s still committed to the project even if the Sacramento Kings are taken off the board as a relocation target. It’s “somewhat inevitable that we will eventually have a team out here,” said Hansen (is “somewhat inevitable” like “pretty unique”?) last week, adding that he hopes to have an agreement in principle with the city and county by “late spring, early summer.” At which point he hopes to go after an NBA franchise to play there. It’s worth noting, though, that at this point all we have is a guy with a bunch of unnamed investors and a piece of paper with some numbers on it — including, apparently, a total private investment for team and arena of $500 million, which since the private arena cost is set at $290 million would imply a team purchase price of $210 million, which seems optimistic, to say the least. Indianapolis isn’t the only city whose sports facilities are hemorrhaging red ink: The Superdome Commission, which runs both the New Orleans Saints‘ dome home and the Hornets‘ arena, is looking at a $27.5 million shortfall for the next fiscal year, according to the New Orleans Times-Picuyune. Of course, this may have something to do with the ridiculous leases the state agreed to with its teams, where Louisiana taxpayers actually pay the Saints and Hornets more than $46 million a year combined just to play in their state. “There are not enough monster truck shows in the universe to make up” for the losses, Superdome VP told the state legislature in asking for more tax money to bail out the agency’s budget. While it wouldn’t be quite as simple as underprivileged college students subsidizing the Saints and Hornets profits with their tuition money, that’s pretty close as shorthand.